I started to write about a recent bad experience I had at one of my favorite restaurants, but after a couple of days of cooling off, I realized this was a good example of taking work too personally. It is a simple enough story of a restaurant manager with an attitude. My family went to the Fish Market located on the harbor of San Diego near Seaport Village. 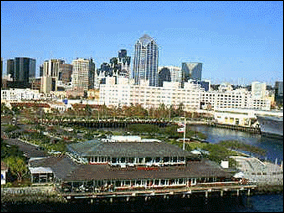 It has great views of the harbor when sitting on the patio or near the large windows. As much as we love the view, we prefer to eat at the Oyster Bar in the front of the restaurant because the food is superior and the staff is very personable. Unfortunately, we were not able to sit at the Oyster Bar this time because seating was not available for our six member party. We ended up sitting in the center of the restaurant with a view of the kitchens on one side and the harbor on the other. When we ordered dinner, we asked for an item to be substituted on the children’s menu to accommodate my daughter’s preference. Our server told us this change required an up-charge. We commented this was done many times for us in the past and without prompting our server went to speak with her manager about our request. Shortly thereafter, the manager stopped by the table and informed us that the substitution was impossible without an up-charge and the other staff was wrong for making the substitution. She told us that she would be speaking with the staff to remind them that such activities were not permitted. The problem was her attitude and how she communicated her decision. Her tone, demeanor, word choice, and body language all strongly conveyed her disapproval of our request. The encounter made us feel like we were trying to cheat the restaurant out of an up-change. This cast a negative tone through the remainder of our meal. We have been going to this restaurant about twice a month for over 10-years and have never been treated so abruptly. I cannot think of another time that I have had someone try to make me feel like a cheat for asking for a meal modification. Because of this experience, we will be taking a break from the Fish Market. This manager, while trying to protect the profits of the restaurant, effectively alienated a customer. She took a too narrow view of what was in the best interest of the restaurant and failed to look at the potential long-term impact of her actions. We were not trying to take the money out of her or anyone else’s pocket. She could have simply informed us that the policy had changed without the condescending attitude and skipped informing us of her intent to reprimand the other staff members, which made us feel terrible. She forgot that she is the highest representative of the restaurant to the customer and should lead by example. When people become too engrossed in their work, they develop an inflated view of their job responsibilities. They personalize interactions and lash out, even unknowingly, at customers and employees that commit perceived violations against “their” company. In other words, they lose perspective. Effective people must take ownership of their work. This sense of responsibility should be encouraged but not allowed to crossover to territorial attitudes and beliefs. In reality, management is more susceptible to falling into this mode than any other group in a company. As management, we invest much of ourselves into the companies we work for that we can easily lose our perspective. When we take work too personally, we end up damaging the very company we work so hard to protect and grow.